This 20" poly brush is great for everyday maintenance scrubbing with a rotary swing buffer. It is a very popular option in healthcare facilities, schools, and retail settings. The uni-block design is molded from one piece of hardened plastic, which allows us to pass on the greatest amount of savings to you, the customer. The brush comes with a universal clutch plate that will fit all of the 20" low speed and variable speed floor buffers that we sell, and will about 95% of all machines out on the market. 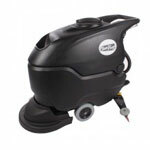 This poly brush is the most economical floor scrubbing brush we have available. It has stiff yellow poly bristles that are good for scrubbing any type of commercially finished floor. It has stiffer bristles than its nylon equivalent, but both can be used to perform the same functions. The nylon will last longer, but the poly is more economical.